The Federal Trade Commission today announced 191 actions to stop fraudulent operations hawking timeshare property resale services and travel prizes, including three FTC cases, 83 civil actions brought by 28 states, and 25 actions brought by law enforcement agencies in 10 other countries. More than 184 individuals face criminal prosecution by U.S. Attorneys and local law enforcement. Timeshare resale scams infographic produced by the FTC. “Con artists take advantage of timeshare owners who have been in tough financial straits and are desperate to sell their timeshares,” Charles A. Harwood, Acting Director of the FTC’s Bureau of Consumer Protection, said during a press conference in Miami. “They persuade owners to pay fat up-front fees by saying they have someone ready to buy the property, but that’s a lie. Our message to timeshare owners is simple: never pay for a promise, get everything in writing first, and pay only after your unit is sold. Our message to timeshare resale scammers is simple, too: law enforcement agencies at every level of government are working together to put an end to this problem.” He was joined by Florida Attorney General Pam Bondi; Wifredo A. Ferrer, U.S. Attorney for the Southern District of Florida; Jay Levenstein, Deputy Commissioner of the Florida Department of Agriculture and Consumer Services; and a victim of an unscrupulous timeshare resale operation. Fraudulent timeshare resellers lure consumers into paying hefty up-front fees, falsely claiming to have interested buyers ready to pay top dollar for the properties. They claim sales are about to happen, but there are no buyers, and consumers lose hundreds or thousands of dollars. Deceptive travel prize promoters trick consumers into paying for discounted or “free” vacation packages supposedly worth thousands of dollars, but most people get nothing of value or have to attend high-pressure timeshare sales presentations. All of these scams reach consumers via unsolicited email, mailed travel vouchers, and radio, TV and online advertising. 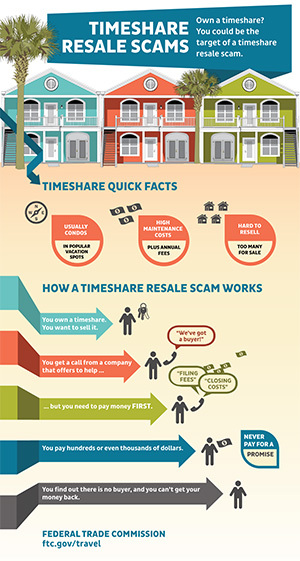 To help people avoid these kinds of scams, the FTC has updated its consumer education materials on new and emerging travel and timeshare resale frauds at ftc.gov/travel, which includes an interactive travel fraud game. The FTC also has a new infographic explaining how a timeshare resale scam works. At the FTC’s request, federal courts blocked three operations [Resolution Trust order | Resort Property order | Vacation Communications order] that took more than $18 million from consumers throughout the country who were trying to sell their timeshare properties. The courts halted the defendants’ allegedly deceptive practices and froze their assets pending litigation. In each case, the defendants allegedly called timeshare owners and claimed they had buyers willing to pay a specified price for their properties, or that the timeshares would be sold in a specified period of time. At most, after charging consumers’ accounts, the defendants provided agreements to “advertise” consumers’ timeshare units. The Commission vote authorizing the staff to file the complaint was 4-0. It was filed in the U.S. District Court for the Middle District of Florida, Tampa Division. On May 20, 2013, the court issued an order that halted the defendants’ deceptive practices, froze their assets, and put the company into a temporary receivership. The Commission acknowledges the assistance of the Florida Attorney General’s Office, the Florida Department of Agriculture and Consumer Services, and the Better Business Bureau of West Florida. The Commission vote authorizing the staff to file the complaint was 4-0. It was filed in the U.S. District Court for the Middle District of Florida, Tampa Division. On May 21, 2013, the court issued an order that halted the defendants’ deceptive practices, froze their assets, and put the company into temporary receivership. The Commission acknowledges the assistance of the Florida Attorney General’s Office, the Florida Department of Agriculture and Consumer Services, and the Better Business Bureau of West Florida. Vacation Communications Group LLC, Gardner Cline L.L.C., Mark Russell Gardner, Tammie Lynn Cline, and Sheldon Lee Cohen, doing business as Universal Timeshare Sales Associates and previously as M.G.M. Universal Timeshares, charged from $1,600 to $2,200 and reassured skeptical consumers, sometimes in writing, that a buyer was ready to close the sale. As the promised closing date passed with no sale, the defendants became evasive, placing callers on hold indefinitely or claiming the buyers were having scheduling or financial problems. They typically denied or ignored refund requests and often disputed chargebacks with consumers’ credit card companies, which often resulted in denial of those requests. The defendants’ U.S. mailing addresses, including Beaverton, Oregon, and Reno, Nevada, were only mail drops; their operations were based in Sanford, Florida, and Santo Domingo, Dominican Republic. The defendants are charged with violating the FTC Act, the TSR, the Florida Deceptive and Unfair Trade Practices Act, and the Florida Timeshare Resale Accountability Act, and with calling consumers with numbers listed on the National Do Not Call Registry. The Commission vote authorizing the staff to file the complaint was 4-0. It was filed jointly by the FTC and the Attorney General of Florida in the U.S. District Court for the Middle District of Florida, Orlando Division. On May 20, 2013, the court issued an order that halted the defendants’ deceptive practices, froze their U.S. assets, and put the company into temporary receivership. The Commission and the Attorney General of Florida acknowledge the assistance of the Oregon Department of Justice, the Oregon Real Estate Agency, the Dominican Republic Instituto Nacional de Protección de los Derechos del Consumidor, the California Department of Real Estate, and the Better Business Bureau of Alaska, Oregon & Western Washington. Resort Property Depot, Inc., et al. Vacation Communications Group, LLC, et al.